Summer really lingered in my neck of the woods, so for all of September I had a hard time starting projects. I just wasn’t inspired to sew much! It was hot, so I wanted to make summer stuff, but I knew it was only a matter of time before cold temps showed up. 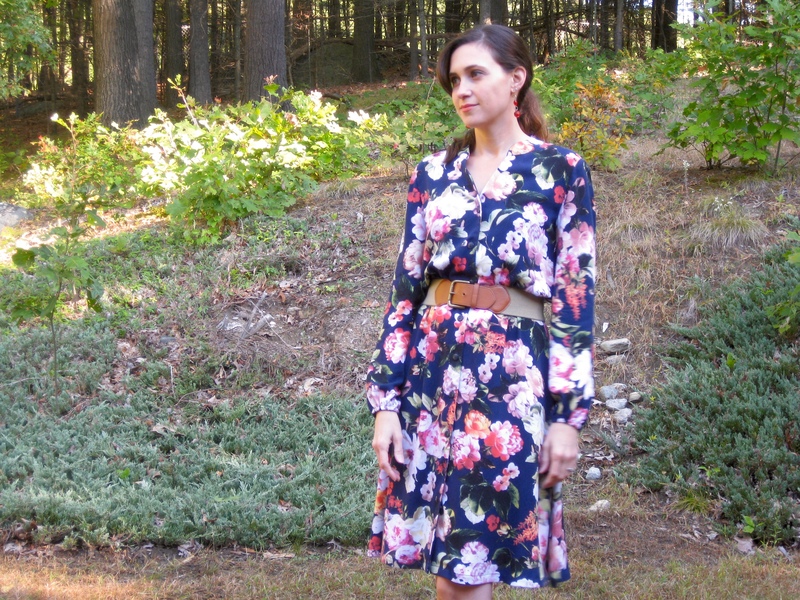 Finally, the weather turned the corner and I’m feeling like I know what I want to sew again. When McCalls made their Fall release, I fell in love with, and immediately picked up M7242. I go particularly weak in the knees for a floral print on a dark background, so this felt like a perfect pattern/fabric match. 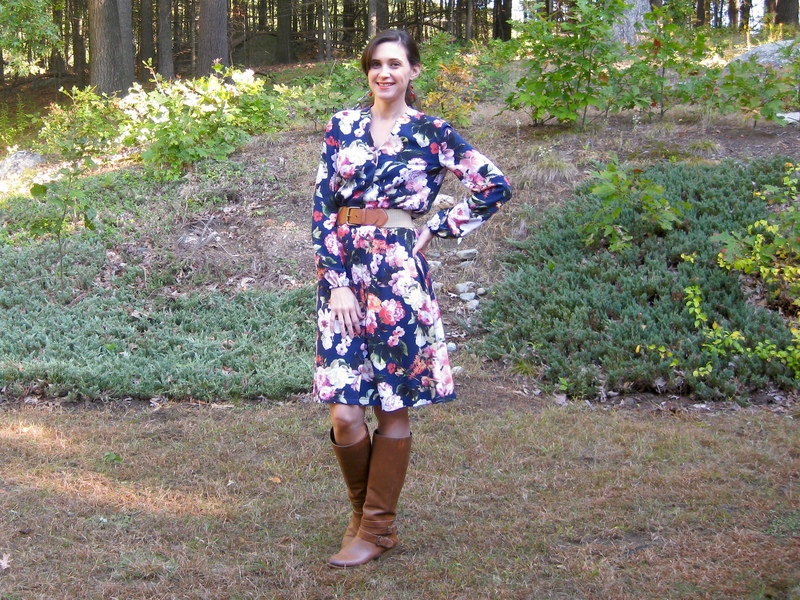 In the beginning, I had grand plans for making the dramatic long-sleeved maxi version, but this is a very bold print, so my gut told me to pick either the sleeves or the maxi length. I was close to ditching the sleeves, but in the end I loved them too much to leave them off, especially since this fabric has a very Fall look to it. I was very pleased with the construction of this dress. Sometimes you end up with really odd finishing techniques in Big 4 patterns, but not so here. The elastic casing at the waist is particularly genius, in my opinion. Instead of joining the bodice and waist, finishing the edges together, then topstitching (as with the Saltspring, if you’re familiar with that) you are able to conceal all the raw edges very neatly and bulk-free. Here you sew the bodice and skirt together with a 1″ SA, then trim down the SA on the bodice side. Then on the skirt SA you turn and press the edge in 1/4″, press it all up to the bodice, then edge stitch it in place (here’s photo on IG to show the inside finish). So neat! I’ll be stealing this method for future elastic waist finishes. The neckline is finished with a facing, then the rounded collar is added. I love this little collar stand since it sits nice and flat. It’s actually tempting to take the bodice and alter it to a blouse… it would be very easy to do. There is a tiny bit of hand sewing necessary. The pattern instructs you to hand sew the inner yoke, whereas I prefer the burrito method, as in traditional button up shirts. Then the neckline facing is hand sewn to the yoke seam. The inner collar piece is also hand sewn down. I could have top stitched the collar piece, but my fabric is a rayon twill and things get real shifty and uncooperative real fast; sometimes a bit of hand sewing is less aggravating in the end, so I went with it. The last thing I thought I’d mention—the pattern has the button holes positioned horizontally instead of vertically. 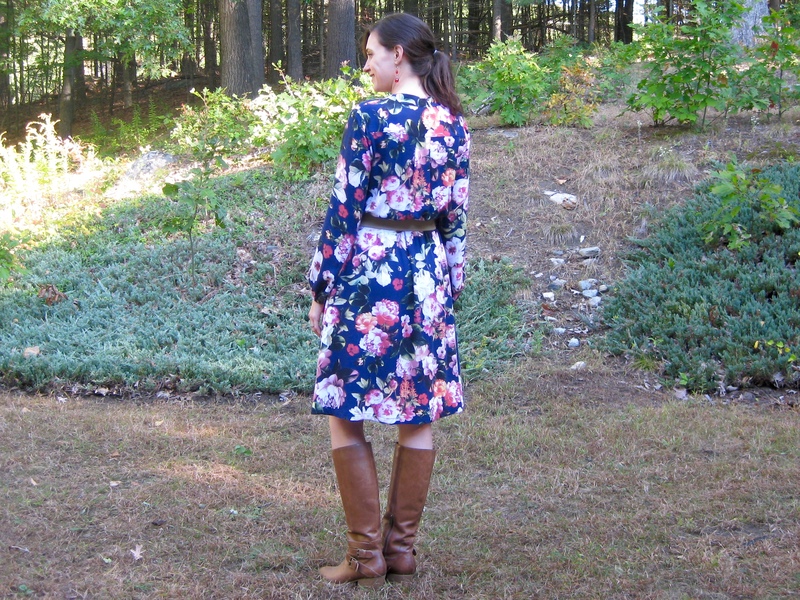 Since this dress gives off a definite shirt dress vibe (back yoke with pleat, collar, etc), I did mine vertically. It just made more sense to me, though it would probably be fine either way. I went down one full size from my measurements, grading from a 10 at the shoulder/bust to a 12 at the waist. Since I didn’t muslin first, I pulled out my trusty Archer to get an idea whether or not I would need to make alterations. I frequently have to shorten armhole depth and raise necklines, but not this time! The shoulder line falls slightly off my shoulder, but it also does so on the model on the envelope, so I’m thinking it’s just part of the design. The sleeves are very bell shaped, so I cut a size 10 sleeve but graded down to a 6 at the wrist to eliminate some fullness but still keep the general silhouette. I typically need to add at least 1″ to sleeves but kept these as drafted so they wouldn’t be too billowy. 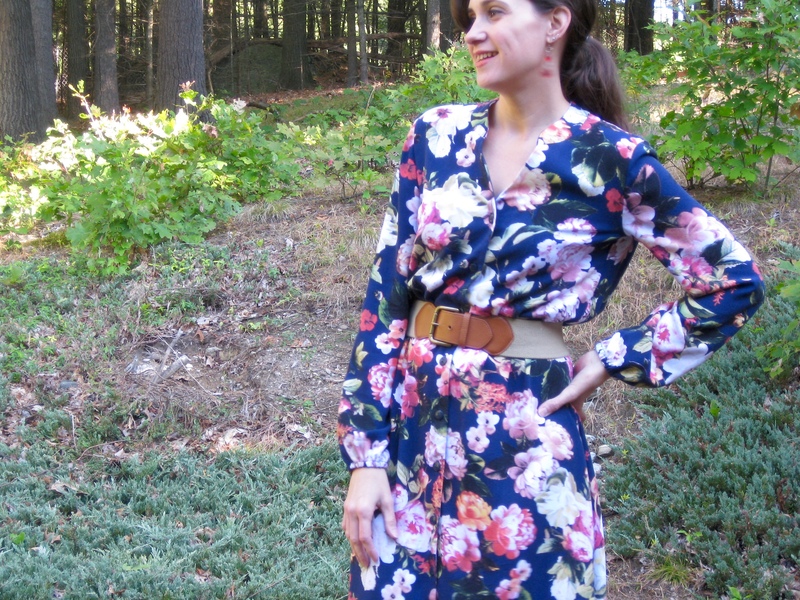 I’m pretty in love with this dress, and am particularly enamored with the 70’s vibe happening. I left the length longer than I usually would for dresses and skirts, but it seemed the right thing to do for the silhouette. If I made this pattern again, I may narrow and top stitch the facings down. It’s not that they want to pop out, but they do catch on my bra and I end up needing to adjust them every once in a while. This isn’t a major annoyance, just something I noticed. Overall, I found the pattern to be well-drafted and genuinely fun to sew! Seriously. I’m trying to stop myself from ditching the Halloween sewing for the kiddos and immediately start making this pattern again!